It might sound extreme, but it's safe to say effective real estate marketing ideas can grow or break your business. In order to be doing business, you've got to bring in potential clients. And having your face up on a bench ad, while useful, isn't always going to seal the deal. So join us, as we look at eight great marketing ideas for real estate, and start bringing in more clients, today! Real estate marketing ideas live and die by the power of a well-designed website. It's just a fact. The process starts with a Google search. With more people doing their business research online than ever before, you need to have an online presence. The first sign your business is "ready to play" is a complete website that comes up when people search for your service. Make sure it's mobile friendly, too. Websites need to be optimized so that they look good on a phone or tablet, or you'll miss out on large groups of potential clients. Once your website is up and running, find ways to use it and keep the content fresh and relevant. Local market quizzes, infographics, and user reviews are all easy enough to gather, and help to make your digital home look "lived in." When it comes to real estate marketing ideas, sometimes you've got to be a little shallow. Because, in property as in food, your customer eats with their eyes first. You may be tempted to use that awesome new iPhone camera to take a few filtered snapshots around your property. And the truth is, with luck and advancements in technology, you might get something great. But why take the chance? There's a reason professional photographers charge for their services. They control the lighting, use angles to make rooms look bigger, and can edit each photo to look its absolute best. If it's worth taking a photograph of, it's worth taking a really good photograph of. Lastly, a good tip for creating a captivating picture of a living area is to use pets in photos. With a handsome pup or a luxurious kitty stretched out on the living room carpet, it would be hard not to imagine making a home in that living room. If your real estate business isn't active on social media yet, you're missing out. Start by registering your business on Facebook, Twitter, Pinterest, Instagram and even Google+. Make a few posts on each platform (with pictures on Instagram), and reach out to readers and reader groups within your industry. Try to make connections by speaking to readers about interesting real estate news and specials you may be running. Try to keep it engaging and not too "salesy," and you can create some great promotions. Remember that blogs are a great opportunity to create consistent content for people to read and associate with your business. If you can keep it on brand, while engaging with trending topics from the real estate industry, your blog can be a great piece of marketing material. You're looking for clients and guess what? There are people out there actively looking to sell their home. You just need to connect with them. At Landvoice, that's where we come in! We'll provide you with the most up to date contact information for the FSBO and expired listings in your area. These are the lowest hanging fruit in real estate because they are actively trying to sell their property and want to get it done quickly! And when we provide you with their phone numbers quicker than anyone else can, you'll be able to list countless more properties. Check out our Solutions page to learn more. Part of marketing is getting people to associate your brand with a specific voice, message, or hook. Are you a real estate company that takes its services very seriously? Perhaps you want people to think "fun" or "irreverent" when they hear your name. Whatever the case, the quickest way to give your business a marketing voice is to lend it your actual voice. Consider scripting, filming and promoting a series of videos with your business' brand slapped all over them. The more often you produce them, the more chance you'll have of getting your name shared and perhaps even going viral. A very popular option for many modern real estate agents, virtual tours are less of an "option" and more of a "must have." Whether you use still photos and editing software, or a sophisticated 360 camera, creating interactive virtual environments is easier than you might think. However you do it, a polished virtual tour gives your future clients the opportunity to feel like they're already in their soon-to-be home. And, not only that, you'll seem like a professional business owner with their finger on the pulse of the modern real estate. It may sound heartless, but the best lesson is someone else's failure. Keep your eye on your competition's websites, social media, and comment sections. You don't need to be a vulture about it, but keep a wary eye out for negative reviews, complaints, broken campaigns, and videos that missed the mark. This will help you avoid making the same mistakes the people nearest to you in the real estate food chain made when the time comes for your marketing. And, of course, the opposite applies as well. When your biggest competitor absolutely crushes their video marketing campaign, it's time to take notes! Observe which elements of their marketing seemed to work best, and find interesting ways to do something similar with yours. Our last point is another tip of the hat to the marketing measures of old. Get a good looking business card. No, a really good looking one. One of the best ways to get your business name to ring out long after you're gone is to hand out hot business cards. Look into alternative designs. Small envelopes that contain pieces of moon rock (or something cheaper - we're just saying). Sliding pieces of card that make a picture from a certain angle. Whatever the design, this is a great marketing opportunity, and can really help put your business on the map. Real estate is a competitive industry. You can't bring soft marketing and wishy-washy business tactics to the table and expect to bring in more customers than someone who doesn't. 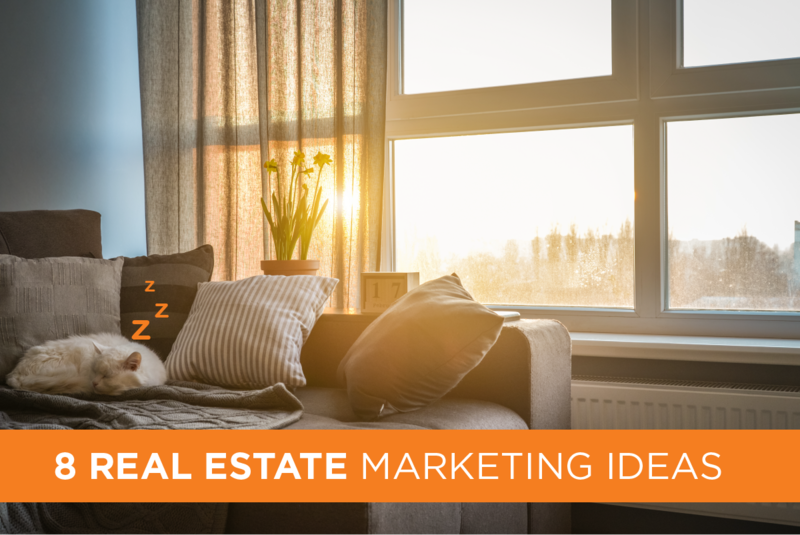 Hopefully, with our list of eight great real estate marketing ideas, that's not even a question anymore. Interested in more ideas and insights to grow your real estate business? Check out some of our other great blog posts, today!